Do We Really Need A Rock And Roll Hall Of Fame? 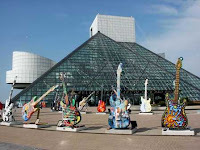 With all the hype around the Rock and Roll Hall of Fame's 25th anniversary, it just makes me wonder - why do we need a rock and roll hall of fame anyway? What's the point? Does it raise money for charity (no)? Does it help starving musicians (no)? Does it help legendary musicians down on their luck after being screwed out of all their royalties by once thieving record labels and publishers (no)? So what's the point? It's not like any sport hall of fame where there are statistics over a career to evaluate. What statistics does a music artist have? Record sales? Concert attendance? Why should any of that matter anyway? Isn't it more important how an artist influenced others that followed? Isn't it more important that his or her fans loved the music, regardless of number of sales? Isn't it more important that an artist has artistic integrity rather than do anything to sell tickets and records? So I say again, "Why is there a rock and roll hall of fame?" It seems that there are some things in life that just don't need a "hall" and music is one of them. The private performance at the induction ceremony every year is pretty good and I try to catch it every year, but we could see the same at a private charity event. A music museum makes sense (it's been a big hit for the Hard Rock Hotel) and is kind of fun, but a hall of fame? Give me a break. "Thank you for your insightful article on the Rock and Roll Hall of Fame. I am a veteran music journalist who spent two years on the Hall's nominating committee and saw from the inside some of the politics at work. "I saw how artists were sometimes chosen for nomination because of their affiliations with the directors of the Hall and others were shot down without so much as a moment of consideration simply because some people in that room didn't like them personally or because an artist had bad blood with someone calling the shots. "At one point (former foundation director) Suzan Evans lamented the choices being made because there weren't enough big names that would sell tickets to the dinner. That was quickly remedied by dropping one of the doo-wop groups being considered in favor of a 'name' artist. "During my second year on the committee, I received a petition signed by 5000 fans of the Moody Blues requesting that the group be considered for nomination. Personally I am not much of a fan, and neither, apparently, was anyone else on the committee (at least no one who would admit it). Still, I felt they were a legitimate contender for the nomination and that it was my duty to present the petition since so many people had taken a lot of time to put it together. I plunked it down on the conference table to a great roar of laughter from the assembled bigshots. "Jon Landau, Springsteen's manager, asked me if I personally was a fan of theirs. 'Not really,' I said. 'End of discussion,' he said. "On the other hand, I saw how Atlantic Records artists were routinely placed into nomination with no discussion at all, due to the large concentration of Atlantic executives on the committee. I saw how so-called critical favorites were placed into nomination while artists that were massively popular in their time were brushed off. I saw how certain pioneering artists of the 50s and early 60s were shunned because there needed to be more name power on the list, resulting in 70s superstars getting in before the people who made it possible for them. Some of those pioneers still aren't in today but Queen is. "I was finally kicked off the committee after writing a guest editorial for Billboard in which I criticized the Hall for its insider ways. "Almost ten years later nothing has changed." And that was in 2001! So one more time - Why do we need a rock and roll hall of fame? Simple answer - we don't. It's a fake honor filled with the worst kind of puffery. And The Moody Blues are still not in (I'm not a fan either, but what criteria keeps them out? - Right, just the opinion of the H of F directors). Rock and Roll is about the feeling you get when you listen to the music. It's the hair standing up on the back or your neck with excitement. It's the urge to listen to the song again, over and over. It's about 20,000 people singing along, and 2 people being knocked out by an artist for the first time. It is not about awards (that includes you, Grammys). 1) Immediacy: There has to be something that grabs your viewer right off the bat. The Internet is flooded with artists who can get your attention quickly and they're the ones that have a chance for big-time viewer numbers. Our modern attention span is such that if you don't grab them within in the first 5 seconds, you've probably lost them. 2) Eye-catching thumbnail: Thumbnails are incredibly important but it's not about being attractive - it's about having presence and charisma. Unfortunately you have to convey that on a picture about the size of a postage stamp online. Given the limited nature of thumbnail selection by YouTube, getting the right thumbnail for your video can be a crapshoot. The only way you can get a better selection of your thumbnail is to become a "partner" (meaning that ads are shown before your video), but it could mean the difference between a just a few or a massive amount of views. 3) Versatility: There's a one-man-band nature of online videos. You have to be able to incorporate your music, do your own camera work, and know how to edit video. There are so many artists who don't know how to do any of this and that's why I'm currently writing a book called The Musician's Video Handbook. Look for it next year. 4) Originality: You need a concept of what you want to do and how you want to get that across that's both unique and original. Originality is easy to demand, but difficult to produce, especially in these days of increased competition. 5) Likability: Everyone wants to watch someone that they would want to approach, who's not full of himself, and is able to laugh at himself. If you can't evoke some sort of of empathetic emotion from the viewer, they're not going to tell their friends. Is that all? Hardly, but it's a start. So many videos are created with a serendipity that makes them huge online hits, but not very reproducible. The really hard part with having a hit video is to follow up and have another one, and regardless of the type of artistic endeavor, that's the sign of true star. 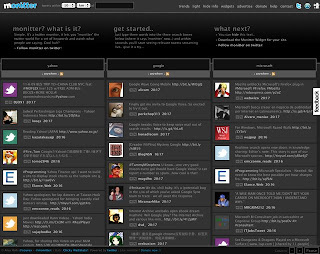 Here are 8 of the best social media tools available for musicians. Actually these are from a post on Mashable specifically designed for entrepreneurs, but if musical artists aren't entrepreneurs than no one is. The original post also contained 10 apps, but 2 of them didn't apply to the needs of an artist. 7. YouTube - it seems pretty obvious, but YouTube can be used for so much more than music videos like interviews, online press kits and virtual after-show parties, among many other things. 6. UserVoice can help track and manage the feedback of your users and customers. 5. MailChimp is an online email service that offers list management, tracking and analysis, and custom HTML templates for up to 500 subscribers and 3000 emails a month for free. 4. Get Satisfaction provides a forum where your fans can get answers to questions, solutions to problems, and submit feature and new product requests. 3. Twitter - it's more important than ever and this post on Mashable will give you links to best practices and tips for using Twitter. 2. Facebook - another one that everyone knows but not everyone takes best advantage of. Read the post on Mashable for helpful hints. 1. Basecamp is a great and cost-effective web-based tool for project management and collaboration that features to-do lists, milestones for important due-dates, file sharing, blog-style messaging, wiki-style writeboards, and time tracking. It's the perfect app for a busy band that has to juggle recording, rehearsals, tour dates, and social media management. Most young artists and bands take vocals for granted. They'll concentrate on improving their skills on guitar playing or drumming, but don't spend much time on the very thing that most listeners key on. This is true especially for background vocals, which usually have the least time spent honing them than any other part. But all vocals are equally as important. A single bad background vocal can badly taint a song no matter how well it's played. Here are a number of items to concentrate on that can really make a difference to a band's vocals. You'll find more detail in my book How To Make Your Band Sound Great. Remember the 3 P’s – Pitch, Passion, Pocket. You need all three for a great vocal. You’ve got to hear yourself to stay in tune. You’ll most likely sing sharp if you’re not loud enough. Avoid alcohol, dairy products, tea, coffee and cola before a gig. All will make it more difficult to sing. Choose the best key. Better to change the key than hurt yourself. Take care of yourself. Gets lots of sleep and drink plenty of water. Rehearse harmonies without the band first. It’s much easier to learn parts that way. Phrasing is everything in background vocals. Concentrate on attacks and releases to stay tight. Pay attention to background vocals. If they don’t sound good, then neither do you! Even though the online world had surmised that the upcoming Google Music would be a totally new music service to go up against the likes of iTunes, Google will not be a service that sells or streams its own music. What it will be doing is adding links to its search results to point to partners like iLike, Imeem, Pandora and Lala (iTunes and Amazon are also rumored to be a partners). Song streams are expected to be playable within the results set, similar to the way YouTube currently works within Google search, according to screenshots tipped by TechCrunch. This is an effort to consolidate media assets whenever into search results. This Wednesday, (Oct. 28th) at Capitol Studios in Hollywood OneRepublic, Linkin Park and Dead by Sunrise will be on tap for a special event that is thought to be the formal introduction to the service. Actually, a feature called Google Music Search has been available for more than a year although most people aren't aware of it. Simply add the word "music:" in front of your query.